‘This is the wage we’re going to pay and we’re going to scan the globe to find people who are willing to work for that wage,...It’s globalization run amok." When it opened for business at the site of a shuttered assembly plant in Windsor, Ont.,CS Wind was hailed as an early success story for the Ontario government’s flagship green energy program, which aimed to spark a renewable resource industry in the province and create jobs for thousands of unemployed manufacturing workers. Yet years after then-premier Dalton McGuinty toured the plant for its December 2011 opening—sitting at the controls of a specialized hoist truck and declaring that his green energy strategy was “creating good jobs for our families”— the company’s use of two dozen temporary workers from Vietnam has become a key issue in an ongoing labour dispute at the factory. The Green Party of Canada, as part of its Plan for Canada's Green Century, will establish a Federal Ministry of Energy Transition to ensure that there is a coordinated Federal Energy Transition Plan to effect the transition from a fossil fuel based economy to one based on the sustainable use of renewable energy and inherently safe nuclear power with a target reduction of 85% reduction of fossil fuel consumption by 2040"
"I wanted to start with this idea of “In One Chart Journalism” ..."
What people “believe” about global warming doesn’t reflect what they know; it expresses who they are. Accordingly, if you want to promote constructive public engagement with the best available evidence, you have to change the meaning of the climate change. You have to disentangle positions on it from opposing cultural identities, so that people aren't put to a choice between freely appraising the evidence and being loyal to their defining commitments. if you think the proportion of survey respondents who say they “believe in evolution” is an indicator of the quality of the science education that people are receiving in the U.S., you are misinformed. Do you know what the correlation is between saying “I believe in evolution” and possessing even a basic understanding of “natural selection,” “random mutation,” and “genetic variance”—the core elements of the modern synthesis in evolutionary science? The U.S. Energy Information Administration (EIA) released an updated Levelized Cost of Electricity (LCOE) paper which is fascinating in that it, unlike previous efforts, includes a complimentary Levelized Avoided Cost of Electricity (LACE). While there will no doubt be a string of shallow references to figures calculated by the EIA, the EIA's work is valuable primarily in the context of a decision being made about supply for a particular region within the context of the remainder of the existing supply mix. The evolution of the EIA's methodology is refreshing as it continues to improve towards a model I suggested last year in The Real High Price of Low-Value Electricity - which discussed changes in the history of the EIA's methodology. It is important to note that, while LCOE is a convenient summary measure of the overall competiveness of different generating technologies, actual plant investment decisions are affected by the specific technological and regional characteristics of a project, which involve numerous other factors. The projected utilization rate, which depends on the load shape and the existing resource mix in an area where additional capacity is needed, is one such factor. The existing resource mix in a region can directly impact the economic viability of a new investment through its effect on the economics surrounding the displacement of existing resources. For example, a wind resource that would primarily displace existing natural gas generation will usually have a different economic value than one that would displace existing coal generation. A related factor is the capacity value, which depends on both the existing capacity mix and load characteristics in a region.Since load must be balanced on a continuous basis, units whose output can be varied to follow demand (dispatchable technologies) generally have more value to a system than less flexible units (non-dispatchable technologies), or those whose operation is tied to the availability of an intermittent resource. The LCOE values for dispatchable and nondispatchable technologies are listed separately in the tables, because caution should be used when comparing them to one another. This is important for Ontario's electricity planning: Quebec cannot provide firm capacity supply to Ontario to meet winter peaks in demand. (Québec) Le dernier hiver n'a pas été de tout repos pour Hydro-Québec. Malgré ses gigantesques surplus, le réseau d'Hydro-Québec n'a pas été en mesure de suffire à la demande cet hiver. La société d'État a été contrainte d'acheter des quantités significatives d'électricité sur les réseaux voisins ainsi que de ses gros clients industriels. Les écarts importants de température observés ont notamment poussé la société d'État à acquérir tout près de 500 000 mégawattheures (MWh) en provenance de producteurs d'électricité hors Québec lors des mois de décembre et de janvier. La société d'État a même fracassé un record de consommation le 22 janvier avec une pointe historique de 39 240 mégawatts (MW). Des données de l'Office national de l'énergie (ONE) indiquent qu'Hydro-Québec a notamment importé 278 000 mégawattheures à un coût unitaire de 27,3 ¢ le kilowattheure (kWh) en janvier dernier. I've posted the quote in French because I figure most can use the same translation I do (Google), and the nuance of the original in the final two paragraphs of the full article might be even better without the clunky translation. I cite this articles because I've seen it referenced as if it states something positive about Germany's renewables escapade, and that demands clarification. For the fifth consecutive month, electricity prices in countries neighboring Germany have decreased, recently released Platts data reveals, due in large part to increased solar and wind generation in Germany. The Platts Continental Power Index (CONT), described as a “demand-weighted base load average of day-ahead contracts assessed in Germany, Switzerland, France, Belgium and the Netherlands,” dropped steadily in early 2014. The index decreased to €35.06 (or about $48.50) per megawatt hour in March, an 18 percent drop from February. Overall, the index is down by more than 39 percent since peaking at €50.50/MWh in November of last year. A surcharge is applied to recover the full cost of supply. The EEG-Umlage is the surcharge in Germany, and working with data from the German Transmission System Operators, and pulling some figures from that data it appears to me the EEG-Umlage recovered, from Germany's consumers, about ~$1.1 billion more Euros in the first quarter of 2014 than it did in the first quarter of 2013. The following article is posted to the new site for Wind Concerns Ontario (as a download). "The action taken by the Finance Minister as a response to the AG's 2011 “audit” was to arbitrarily backdate and revise the “revenue streams”, reducing them by $4.4 billion for the year ended March 31, 2004 and $1.8 billion for the year ended March 31, 2011, increasing the “RSD” by $6.2 billion thus extending the period the DRC would remain on ratepayers bills. Those adjustments were made in Finance Minister Dwight Duncan's 2012 budget as he rewrote the Province's financial history! The Auditor General's (AG) report released December 10, 2013 highlighted some of the problems inherent with taxpayer owned Ontario Power Generation Inc. (OPG), particularly its above market human resource costs. Unfortunately the report didn't ascribe specific costs to Ontario ratepayers. The report noted power generation levels had fallen considerably over the past decade but again failed to cite the reasons. Despite those human resource costs, OPG is still Ontario's low cost electricity generator as noted in their press release of March 6, 2014 wherein they state their average revenue per kilowatt (kWh) in 2013 was 5.7 cents versus 9.9 cents per kWh for private sector generators. Natural gas-fired power plants accounted for just over 50% of new utility-scale generating capacity added in 2013. Solar provided nearly 22%, a jump up from less than 6% in 2012. Coal provided 11% and wind nearly 8%. Almost half of all capacity added in 2013 was located in California. In total, a little over 13,500 megawatts (MW) of new capacity was added in 2013, less than half the capacity added in 2012. More than one billion people globally lack access to electricity, and billions more still burn wood and dung for their basic energy needs. Our High-Energy Planet, a new report from an international group of energy and environment scholars, outlines a radically new framework for meeting the energy needs of the global poor. According to the authors, the massive expansion of energy systems, mainly carried out in the rapidly urbanizing global South, is the only robust, coherent, and ethical response to the global challenges we face, climate change among them. The time has come to embrace a high-energy planet, they say. "You can't count on the wind blowing at the time you need the energy"
"There's no prospective view of any future wind farms to be built in the province," said Ed Pakulak, the Canadian spokesman for U.S.-based Competitive Power Ventures (CPV). "The focus is hydroelectric power." Hydro said it examined the performance of the St. Leon and St. Joseph wind farms during the peak-load hour of each month from June 2007 to May 2013. 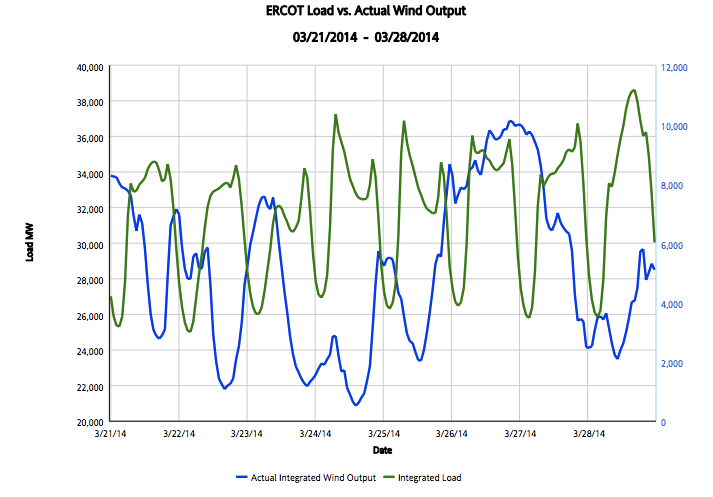 It found the minimum wind generation during the peak-load hour each month was zero or near zero. "Manitoba Hydro has determined that the capacity value of wind generation within Manitoba to meeting the winter peak load is zero," Hydro said in a report to the PUB. News of CPV's decision came a day before former NDP energy minister Tim Sale appears at the PUB to promote more wind generation and tougher energy conservation instead of the expense and risk of two new dams. The answer is clearly Sale doesn't understand the term "alternative"
Wind is not an alternative to any other generation capacity where it has no capacity value - and "conservation" is a term poorly applied to electricity and should go the way of the dodo bird ("efficiency" mercifully replacing it). Why Shale Gas Is Toast: Texas Wind Power Sets New US Record is a provocative headline from a site I consider disreputable - Clean Technica. In the Lone Star state, the wind industry hit a new record for generation. On the night of March 26, wind power surpassed 10,000 megawatts of generation, a new high, according to data from the Electric Reliability Council of Texas (ERCOT). That was enough to account for 29% of Texas’ 35,768 megawatts being generated that night. 29% being achievable because not only was generation from wind turbines high, but demand was low. Good for Texas wind, but a record amount of wind capacity on an expanded transmission system (at not insignificant cost) is going to set records. A more pertinent question is when will the records be set, and that it occurs during the low demands of a shoulder season is not good - particularly if the wind did not produce during peak demand periods. ERCOT (the Electric Reliability Council of Texas) had issued a Conservation Alert as recently as March 3rd. Similar alerts were issued in January and in February. 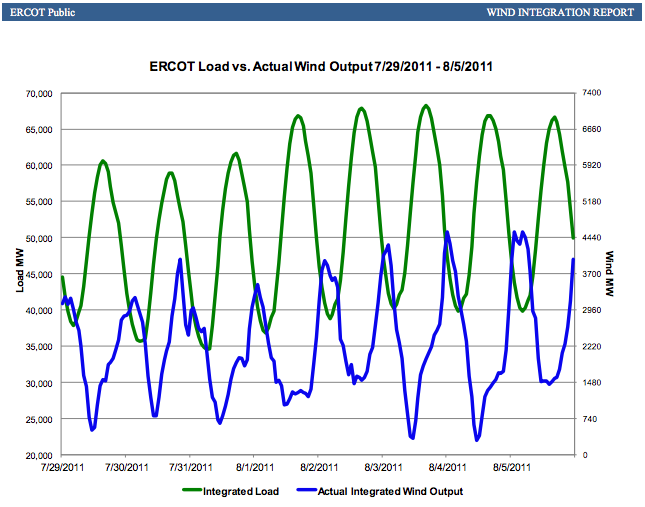 Checking ERCOT's Wind Integration Reports for the period of each outage shows high demand accompanied by erratic, and occasionally very low, wind output. ERCOT's summer demand peak is higher than its winter peak, and the wind output pattern often less erratic in the summer, which is not to imply it's stable. Peak summer demand occurred on August 3rd, 2011 during a week that displayed typical Texas wind performance extraordinarily well - dropping as demand rises each day. If gas is toast there will be people freezing in the winter and melting in the summer. Gas is not toast, but gas generators - along with other generators with higher fuel and operating costs - are not performing well. KKR & Co., TPG Capital and Goldman Sachs Capital Partners, the firms that acquired Energy Future Holdings Corp. in the biggest-ever leveraged buyout, would be all but wiped out in a reorganization plan being discussed, said three people with direct knowledge of the negotiations. The power producer’s acquisition at the peak of the buyout boom in 2007 was essentially a bet, using $40.1 billion of debt and an $8.3 billion equity check, that natural gas prices would rise. Instead, prices have fallen 68 percent since July 2008. Gas prices set the cost of electricity in the Texas market. Twice bitten: once by the falling price of natural gas (from a 2008 peak), and once by the addition of variable renewable energy systems (vRES) that are also crippling German utilities despite much higher gas prices in Europe. Texas is left appealing for conservation - and struggling to find a method to make entering the market attractive to firm generators (with capacity available at peak demand periods). How's that affecting the oil and gas industry? The number of U.S. oil rigs spiked to a record high last week due to booming activity in South Texas’ Eagle Ford Shale and other domestic shale plays. Americans used more renewable, fossil and even nuclear energy in 2013, according to the most recent energy flow charts released by Lawrence Livermore National Laboratory. Each year, the Laboratory releases energy flow charts that illustrate the nation's consumption and use of energy. Overall, Americans used 2.3 quadrillion thermal units more in 2013 than the previous year. The Laboratory also has released a companion chart illustrating the nation's energy-related carbon dioxide emissions. Americans' carbon dioxide emissions increased to 5,390 million metric tons, the first annual increase since 2010. One theme that caught my attention in reviewing my web sources this morning relates to a post I'm slowly working on about a traditional topic - energy planning in Ontario - and the leak of budget strategy documents in Ontario showing the governing party enlisting the bureaucracy in a campaign to bolster the electoral chances of the governing Liberal Party. ...the Ontario Liberals’ month-long pre-budget “communications rollout” that was leaked to the opposition PCs, apparently by disgruntled civil servants, and released on Monday, is something to behold. It’s not that any one of the items that PC finance critic Vic Fedeli said added up to almost $6-billion in new spending was particularly surprising, and it’s not that the government has engaged the non-partisan bureaucracy in developing its plans, since the civil service is always acting to some degree at the behest of its political masters, but it’s the breadth of the thing that shows just how much the Liberals are developing not just a budget, but an election strategy. And it shows how, even under Kathleen Wynne, this government is putting politics ahead of all other considerations. VIENNA, 2 April (UN Information Service) - Cancer levels are likely to remain stable in the wake of the 2011 Fukushima-Daiichi nuclear power accident, according to a new UN report released today. The report is titled Levels and effects of radiation exposure due to the nuclear accident after the 2011 great east-Japan earthquake and tsunami, by the United Nations Scientific Committee on the Effects of Atomic Radiation (UNSCEAR). Nevertheless, it notes a theoretical possibility that the risk of thyroid cancer among the group of children most exposed to radiation could increase and concludes that the situation needs to be followed closely and further assessed in the future. Read the full press release ... and if you strongly idendify with the Green Party, then yell and bash UNSCEAR and call for more testing and just generally try to make somebody terrified of something. A couple of posts from the German Energy blog today: one on a long awaited draft of a bill to reform the EEG mechanism that spurred growth in renewable energy. It's seen as a very important bill, but the time frame for comments doesn't look very serious. The Federal Ministry of Economic Affairs and Energy (BMWi) has today published a new draft bill for a reform of the Renewable Energy Sources Act (EEG) and circulated the draft to top level municipal and other associations for review and comment. The deadline for comments is 2 April 2014 17:00 CET." The extremely short time span to comment of less than two days is challenging (and apparently not an April’s fool day joke). It remains to be seen how much meaningful input can be produced in the given timeframe. Results shall be published. The Federal Cabinet’s decision on the official draft bill from the government (Regierungsentwurf) is scheduled for 8 April. The second post on the German Energy blog today indicates declining growth in solar capacity. Bruce Sharp, the superior Ontario energy analyst (and the one that initially exposed the hidden cost in the Oakville Generation Station relocation agreement), has some advice on how to handle calls from retailers offering a deal on natural gas contracts. Union Gas and Enbridge Gas Distribution rates will jump April 1. This will be no joke, with Union and Enbridge gas supply rates each rising by 9 cents per cubic metre. These increases arise from Quarterly Rate Adjustment Mechanism (QRAM) processes, whereby natural gas utilities set temporary rates that reflect their view of natural gas prices for the forward-looking period and add a surcharge or rebate to reflect the previous quarter's variance between what customers paid for natural gas and what it cost the utilities to provide that natural gas. Two factors behind the recent variance are a direct result of this winter's cold weather, which caused both average natural gas prices and consumption to be higher than anticipated. The third factor is an increase to the forecast price of the natural gas utilities will purchase for their customers during the coming quarter. What does this mean for consumers and residential natural gas retailers that might come to their door? Well, these so-called "door-knockers" are always out hunting for new marks. In particular, they thrive on these price blips as it gives them a fresh fear story to use to their advantage. As well, the past variance recovery embedded in new rates will give retailers a very large but temporary buffer. This will allow them to make their usually unattractive pricing look slightly more competitive or charge even higher prices and make more profit. In making a decision, residential customers need to know their natural gas distributor makes no profit on natural gas sold and that the typical target profit on a retailer's residential natural gas contract is $200 per year.